Light variable winds and clean easing surf from 2-3ft on the Surf Coast magnets yesterday morning, bigger and bumpier to the east. Today a new W/SW swell is on the build with mid-period energy this morning coming in at 3ft on the sets across the Surf Coast and 4-5ft to the east with weak onshore winds across selected locations. The swell should continue to strengthen through the day with 4ft sets likely later on the Surf Coast and 6ft sets to the east with moderate to fresh S'ly winds. The strong and slow moving frontal progression responsible for today's building and strengthening W/SW swell is now passing under Tassie, with the largest increase in size out of the SW due tomorrow morning. Consistent surf around 4ft is due on the Surf Coast with 5-6ft+ waves to the east, but winds are now looking average. This is due to an approaching mid-latitude low slowing, but one positive is that winds on Friday are now looking great for longer. But back to to tomorrow and a moderate E/SE breeze is due through the morning, tending more SE-S/SE into the afternoon creating average conditions across all spots. Friday looks great with a moderate to fresh N/NE breeze during the morning cleaning up the beaches, tending N/NW across the Surf Coast through the morning ahead of a mid-afternoon SW change. Surf Coast magnets should still be 3ft with 4ft+ sets on the Mornington Peninsula, easing through the day. A temporary low point in swell is expected Saturday morning with a W/NW breeze, but the Surf Coast only looks to be a minimal 1-2ft. From mid-late morning though our new W/SW groundswell from the mid-latitude low is due to fill in. 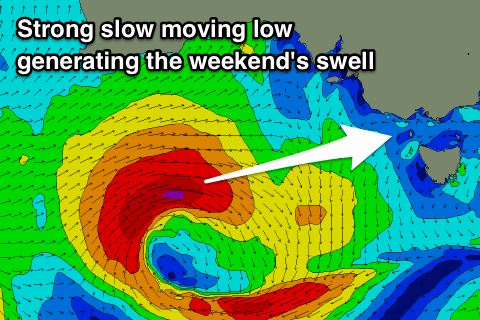 This low has formed west-southwest of WA and will drift east-southeast into our swell window tomorrow, with a great fetch of gale to near severe-gale W/SW winds forecast to be generated in our western swell window. The low will be slow moving, helping to generate a moderate to large sized W/SW groundswell for Saturday afternoon, easing Sunday. The Surf Coast magnets should build to 3-5ft by the afternoon, with 6ft to occasionally 8ft sets to the east as winds hold from the W/NW until about mid-afternoon. The swell should start easing Sunday from 3-4ft and 5-6ft+ respectively with a morning W/NW breeze again, S/SW into the afternoon. Make the most of the weekend as next week looks mostly onshore besides a period of possible lighter winds Tuesday. A good new long-period SW groundswell is also due to fill in on Tuesday generated by a strong polar low, but we'll look at this in more detail Friday. How did it get named the surfcoast? The local government for this area is called the Surf Coast Shire which draws its name from the whole area known for good surf. Also, the name looks good on any tourist marketing for the area. Bit like the Surfers Paradise up north. Sorry the question was retorical. The 'lack of' surf coast would be more fitting lately.